Lunch With Peggy Keller and the Tigers of India October 7 2015.
brookser	Events	Comments Off on Lunch With Peggy Keller and the Tigers of India October 7 2015. 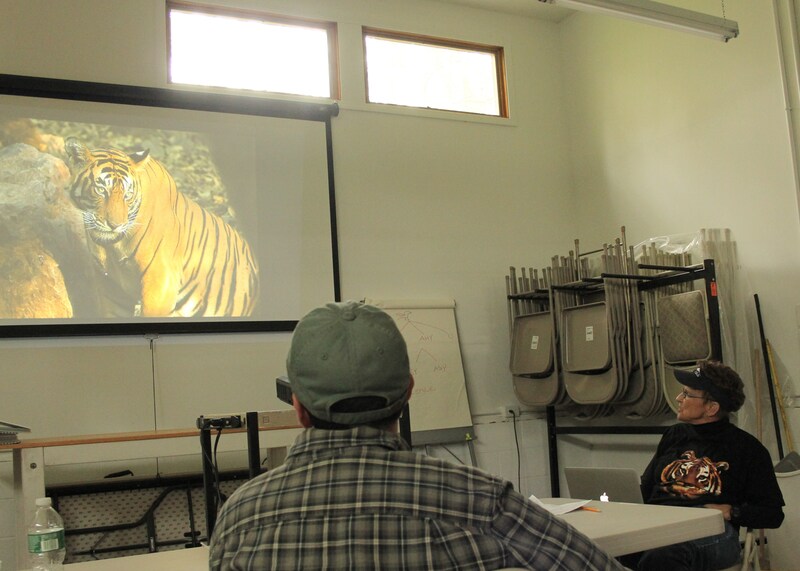 A large crowd filled the EWB Education Room at 1 PM on October 7, 2015 for lunch and a spectacular program on Peggy’s visits to India to film tigers and birds. 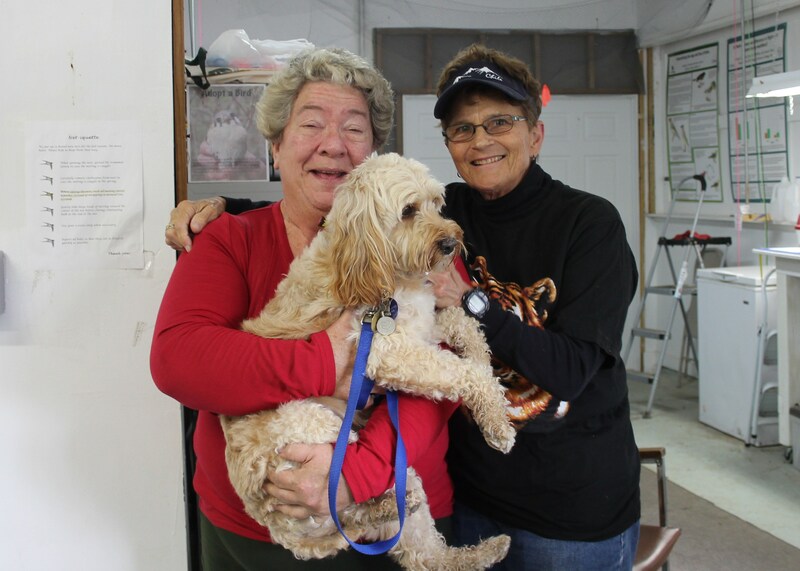 and Shirley’s adorable dog Lucy! Andrea Patterson	Fall Banding	Comments Off on Hit or miss! 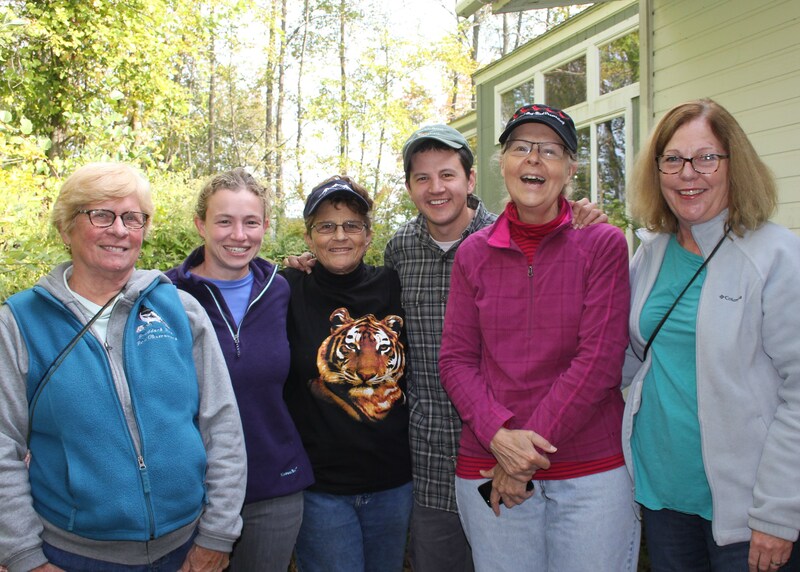 Monday October 26, 2015: 61 new birds of 14 species, 14 recaps. Bird of the day was American Goldfinch with 21 new bands. It was a feast-or-famine day at the nets today. Some runs we’d come up empty or nearly so, while other runs we’d net 10 or 20 birds. We saw flocks of finches flying hither and yon all morning, and small groups found our nets three times. On one net run, the only bird we captured was a Tufted Titmouse. They tend to be talkative, and this one was no different. A flock of siskins was in the trees nearby, and it was fascinating to watch their behavior in response to the squawking titmouse. Some of the birds flew closer to find the source of the commotion, and several actually came in close enough to brush the net. They almost hovered – inches away from being caught – brushing the nets with their wingtips, and then backing off to perch again in the trees. The neatest bird we caught today was a recapture. Most of the birds we recapture have been banded earlier in the day or week. We sometimes capture birds originally banded in other seasons, but they are almost exclusively local birds that live in the area or that breed here in the summer. Today, we caught a bird that lives here in the winter! 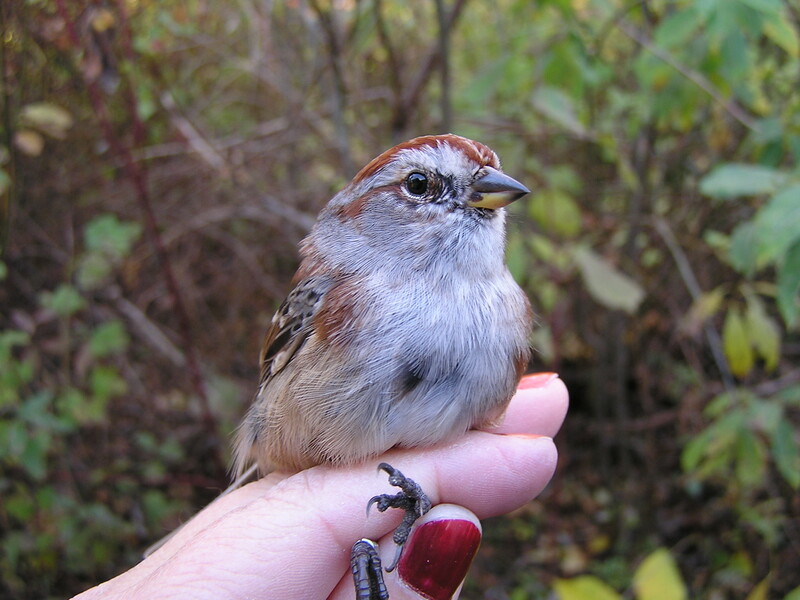 The American Tree Sparrow below was originally banded on 22 Oct 2012 as a hatch year bird. They breed far north of us, and so this bird has likely decided our site is a great place to spend the winter! 4 year old American Tree Sparrow. 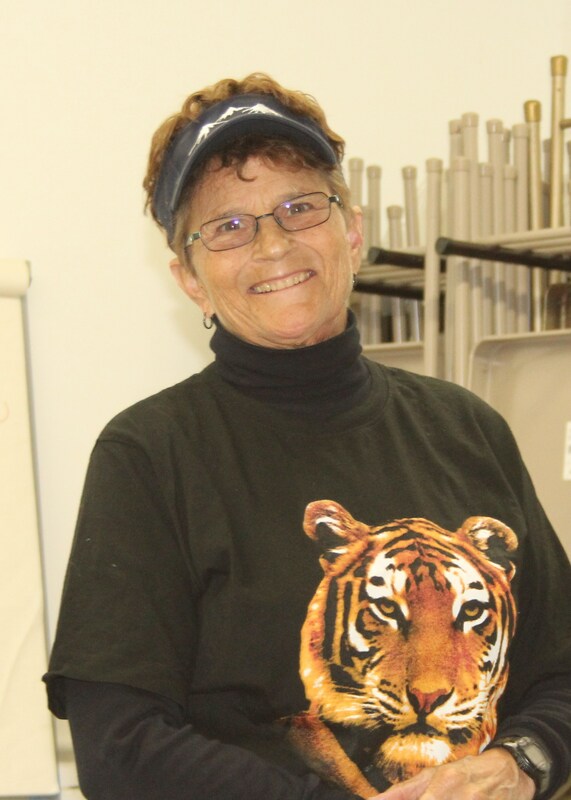 Drum roll please . . . .
Andrea Patterson	Fall Banding	Comments Off on Drum roll please . . . .
Sunday October 25, 2015: 41 new of 11 species, 20 recaps. Bird of the day was . . . a really good one, so keep reading!!! Mid-morning, we had a little bit of excitement as we caught three different finch species. We thought the trio would make a neat comparison shot, but the birds had other ideas (the goldfinch was really fascinated with something behind him) so we took one quick shot and let them go. American Goldfinch, Pine Siskin, and Purple Finch. After this run, the Purple Finch was actually the Bird of the Day with five new bands. As the morning wore on, Golden-crowned Kinglet eventually caught up and they were tied at five birds each for a couple of hours. At hour 5.5, we headed out expecting more of the same. Little did we know! When the netpickers met up, Barb commented that she had a new contestant for bird of the day. It was a common feeder bird for her when she was growing up, and it was one she had never banded. I had no idea what it could be (I didn’t know she grew up in Alaska!) . . . and never would I have guessed that she had 5 Common Redpolls! We banded them and released them, and figured that was the end of it. Our “bird of the day” would be a three-way tie. 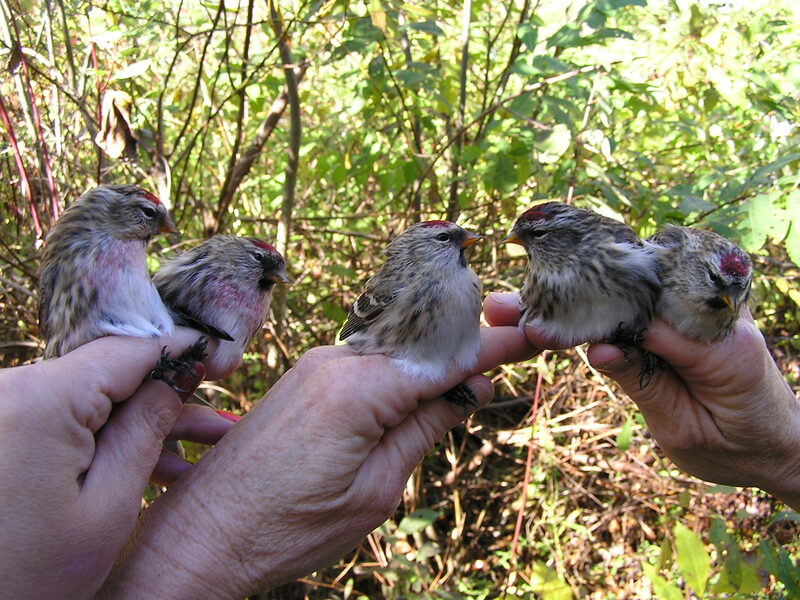 A quintet of redpolls, all of different sexes and ages. 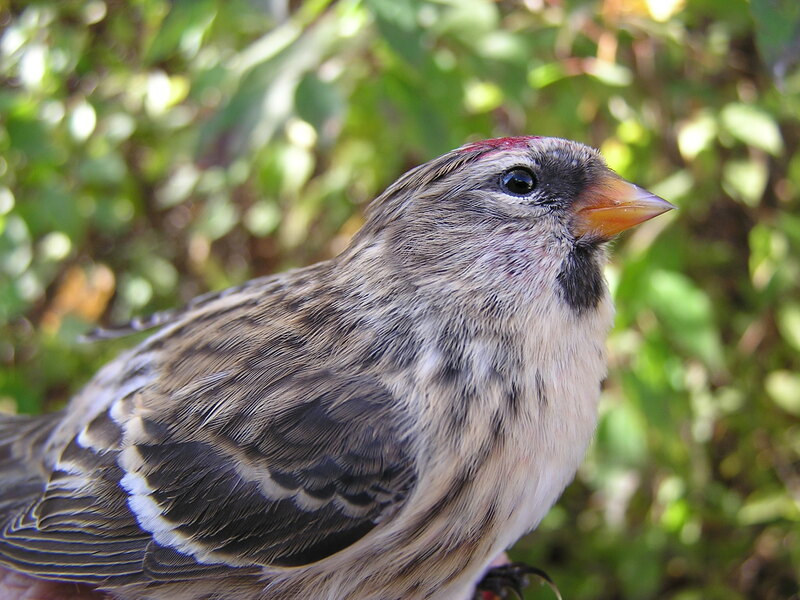 We were really excited, because our database only shows us banding 7 Common Redpolls – and it was back in 1999! Ryan believes others have been banded at the station, but it’s likely they would have been banded late in the season by Bob McKinney and hence not necessarily in the main BBBO database. At hour 6.0, we headed out to close. We pulled a few leaves and a few birds out of nets, but there wasn’t anything to speak of until we got to net 70, which held about 20 birds – all of them siskins and redpolls! We ended the day with 14 Common Redpolls, and they are DEFINITELY the bird of the day! You just never know what the fall will bring! 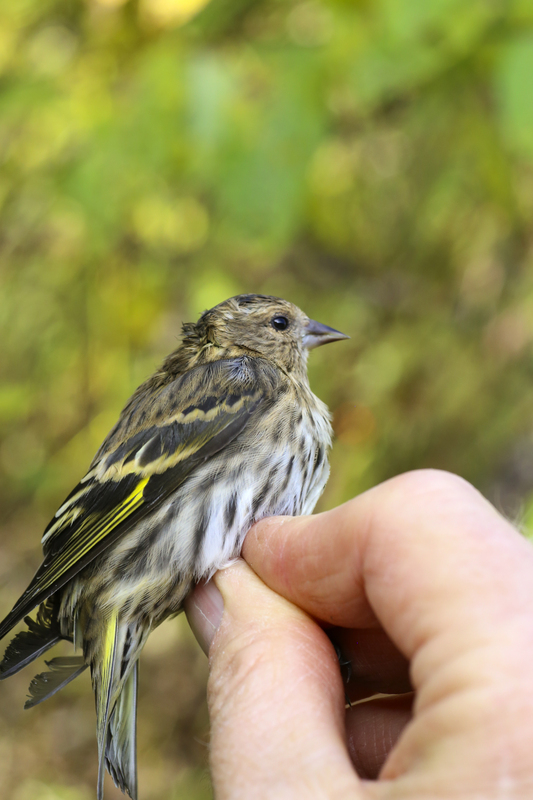 154 New Bands (93 Pine Siskins) – MAKING IT OUR BEST DAY OF THE FALL SO FAR! 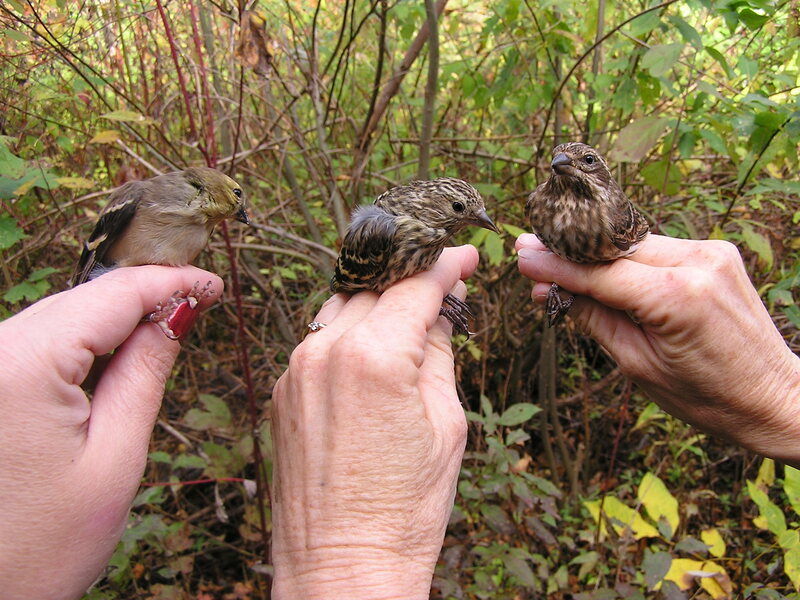 brookser	Fall Banding	Comments Off on 154 New Bands (93 Pine Siskins) – MAKING IT OUR BEST DAY OF THE FALL SO FAR! Friday October 23, 2015. 154 new bands, 9 recaps. New species Pine Siskin. The day started cold enough for us to count our layers, with Alice coming in first place! We had three people to open nets until Andrea showed up. So the four of us opened a;ll nets, figuring all would be the usual with numbers that were manageable. The net checks brought in enough to keep Claire and me busy banding. Andrea was plugging away at that relentless paperwork. 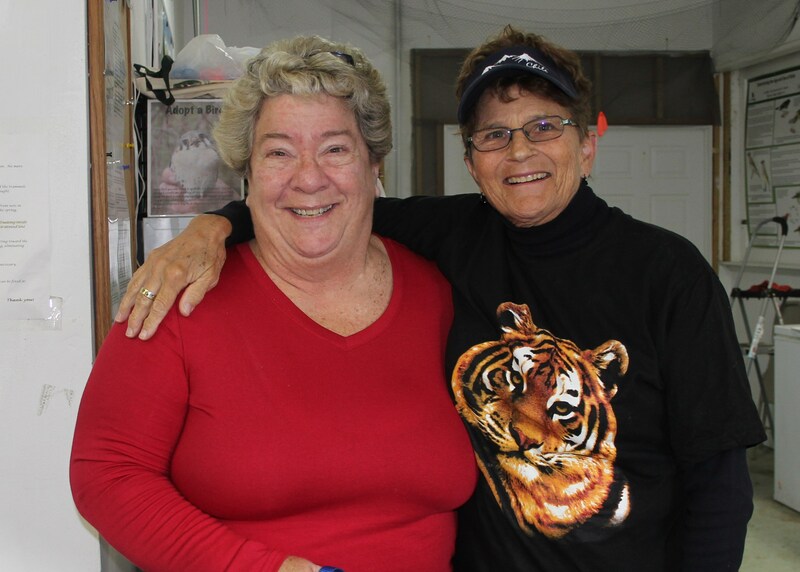 At hour 4, the phone rang and as Andrea started to answer it, the words out of her mouth were “oh … it is probably Marilyn saying there are a lot of Pine Siskins” laughing. But I could hear through the phone “bring all the bags you have to the back aerials!” So we ran, walked as fast as we could, and came in with about 100 birds. The winner of the net check and the day was Pine Siskin at 93 banded! Thank goodness Andrea dropped by to do paperwork! Saturday October 24, 2015: 43 new birds of 12 species, 13 recaps. Bird of the day is Golden-crowned Kinglet with 19 new bands. We were excited to see a flock of nearly 50 Rusty Blackbirds (with a few Red-winged Blackbirds mixed in) whistling in the trees near the swamp. Although they were flying near all 6 aerial nets, we didn’t catch a single one. Nor did we have a repeat of yesterdays siskin event. We saw and heard a couple small flocks, but they must have been warned to stay up high! We were disappointed that the blackbirds and siskins avoided us, but we were grateful the looming rain stayed away. The radar showed rain all around us, but it was on a line that took it just to the NW of us. We banded our 4,000th bird of the season today; it was likely a Hermit Thrush or Slate-colored Junco. That total includes 675 birds banded between July 20 and August 15 in the “fall pre-season”. Just one week of banding remains! Watch this space . . . post (including info on 93 siskins!!!) coming soon. Black-throated Green Warbler Makes the Day! 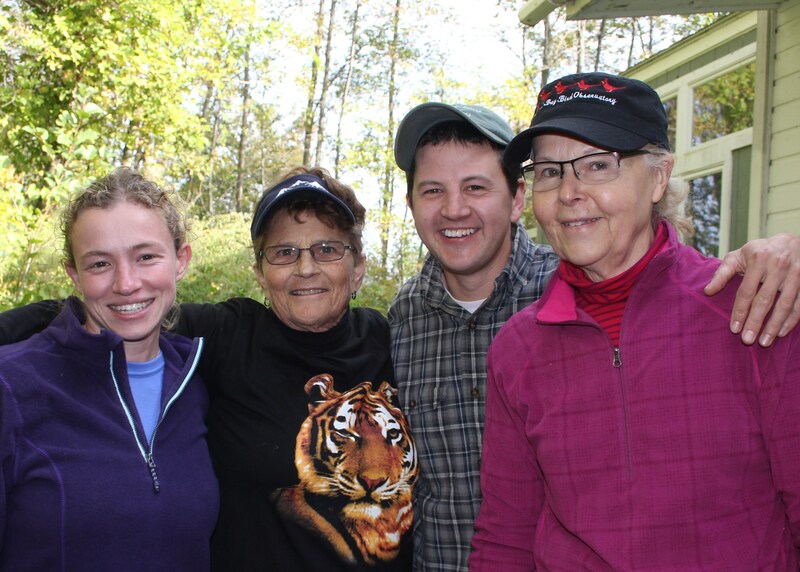 Andrea Patterson	Fall Banding	Comments Off on Black-throated Green Warbler Makes the Day! Thursday October 22, 2015. 33 new bird banded of 13 species; 16 recaptures. Even though the station will be open next week, this was the last time that the entire Thursday crew worked together this fall. We had a good day. The White-throated Sparrow was the bird du jour with nine new birds banded, followed by the Golden-crowned Kinglet with five new birds banded, and the Ruby-ccrowned Kinglet (four new birds banded. 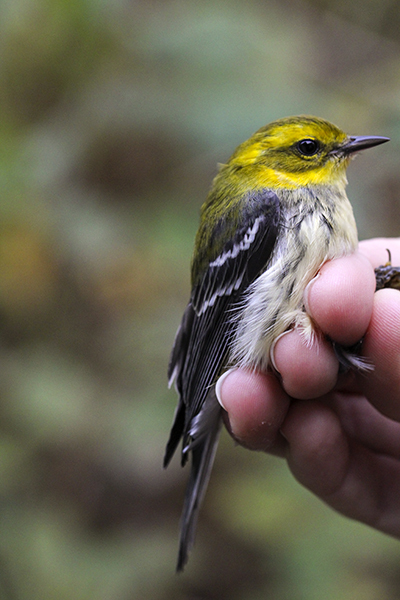 The most interesting bird banded was a Black-throated Green Warbler. Since this was the last time the Thursday team will have banded together this fall season, I wanted to say thank you to all of you for a great fall season!